Acqua Colonia Lavender & Thyme is a perfume by 4711 for women and men and was released in 2009. The scent is fresh-spicy. It was last marketed by Mäurer & Wirtz. From my time "back to nature", in which I was really led back to the forgotten healing powers of plants, I know a "herbal witch". This is a woman who is no longer quite young, who kneels down deep into this area and can tell us wonderfully about it. These stories are entertaining and instructive during walks with such poetic names as "With Lavender to Provence", which only take place in parks, cemeteries and gardens here in the city. She also clears up the old myth that roses and lavender thrive together in a useful way because lavender aroma is said to be good against lice. It also teaches us that there are many varieties of thyme; not only the dark green, which we use to season cold and hot dishes, but also white leafy ones and those with quite nicely colorfully patterned leaves. They all have a very bitter, spicy scent and the small leaves should not be cut, but ground between the fingers in order to fully develop their aroma. In old books (and also with me) it says there: Thyme (or also Quendel) rebbeln. Thyme stands for energy: because of its stimulating, strengthening scent. In naturopathy it dispels confusion, promotes logical thinking and dispels doubt after waking up and the beginning day. Its fragrance is also said to renew mental stability; which is why I used to put a few drops of thyme oil in the water of my fragrance lamp in stressful situations. 4711 makes use of this energy in his "Acqua Colonia Lavender &Thyme". Just a few splashes are enough to experience the feeling of freshness and to feel more alive and awake. Even after the first alcohol boost is over, this fragrance still cools pleasantly. Lavender is given to the vitality donor thyme here to the side. This not only in the flower, but also in the herb, a flattering fragrance spreading creature, is a kind of hermaphrodite. Lavender, one hears, calms, promotes falling asleep and is good for the nerves. I believed that until I tried it: I spent hours deepening at night, instead of calming down. Lavender spreads serenity - that's true! Its complex fragrance seduces and bewitches the senses. It refreshes, purifies the mind and dispels tiredness, fear and worries! That explains my nocturnal hike. Never again "a few drops of it on the pillow"! This balsamic scented plant, which we see in our minds in long rows on large fields, e.g. in Provence, was used by 4711 as a sympathetic partner for the thyme in "Acqua Colonia Lavender &Thyme". Both together give a refreshing fragrance that invigorates and cools. The somewhat scratchy aroma of thyme is harmoniously combined here with the softness of lavender. Some splashes of it into the washing water refresh on very warm days already in the morning; the invigorating smell accompanies so even a little longer. One feels so animated and clean, instead of dusty and exhausted! That's why disposable washing cloths in the drawer are a practical summer purchase, even for the coolest business types. Also ideal for a refreshing wash of the hollow of the knee before a few splashes of Acqua Colonia land there. And among us: As with many "colognes" the alcohol content is also quite high here, which can sometimes be of double use! Who does not know them, the slight weakness attacks on hot days: the circulation no longer plays along. 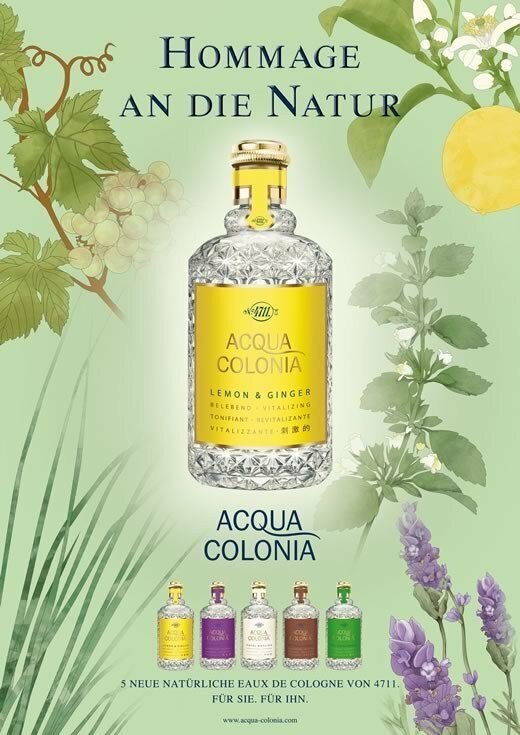 A few splashes of "Acqua Colonia Lavender &Thyme" in a small glass of water and drink slowly - that's good! It does not always have to be "Klosterfrau Melissengeist" (please: this is an example, not an advertisement!). As a lavender tea drinker it doesn't cost me too much to overcome - and it helps! Invigorating herbal effects and alcohol awaken the tired circulation; you quickly feel better again. I do not perceive an additional sweetness; for my senses this fragrance creation consists of thyme and lavender. Maybe more than one variety of each herb was used for this. The shelf life corresponds to that of a scented water; but the strong spiciness remains as a hint nevertheless some time back. 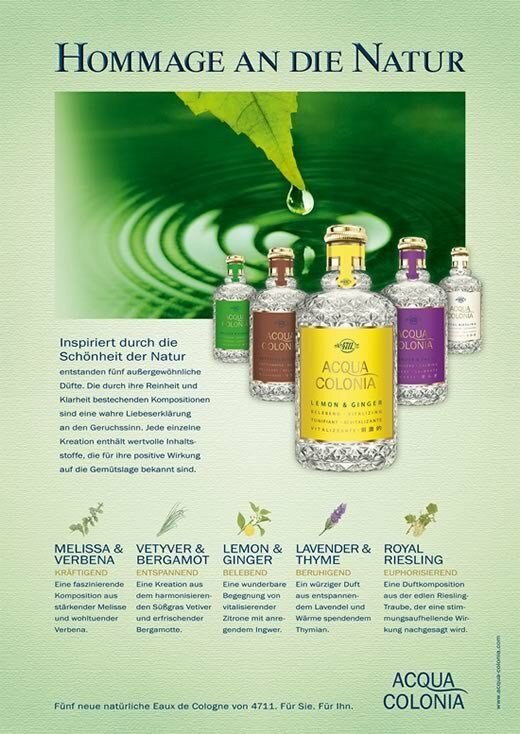 Thus "Acqua Colonia Lavender & Thyme" is an invigorating summer companion; but also after sports and strenuous meetings or long-distance flights an equivalent substitute for the well-known "4711 - Echt Kölnisch Wasser". I like it more because it is softer and spicier = rounder than the classic. That "bites" me in the nose a little bit. If you are looking for a refreshing companion through hot and exhausting days or an encouraging wake-up help in the morning, you should try "Acqua Colonia Lavender & Thyme". My "herb witch" tried, nodded and continued to rub the quendel between her fingers. 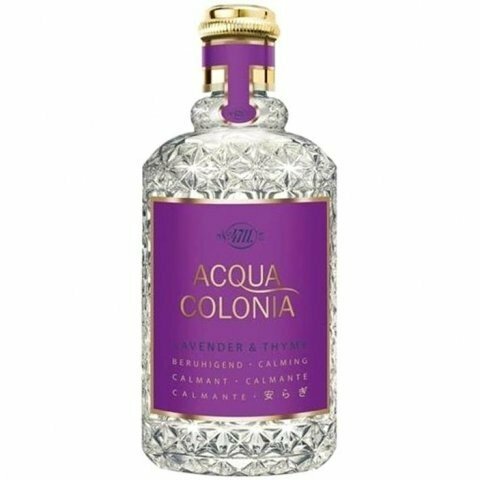 Write the first Review for Acqua Colonia Lavender & Thyme!